It’s always hard when you’re traveling to know which restaurants will be good and which will be bad. It’s a bit of a crap shoot, honestly. My preference is to ask locals and to wander around and try to figure out which places are good or bad. It’s kind of random, but my gut instinct tends to be good. Jessica prefers to have a bit of a plan. So we try to do some research online and have a list of a few go to places. On this trip to Playa del Carmen, one of our safety places was Blue Lobster. Turns out it wasn’t such a good idea. 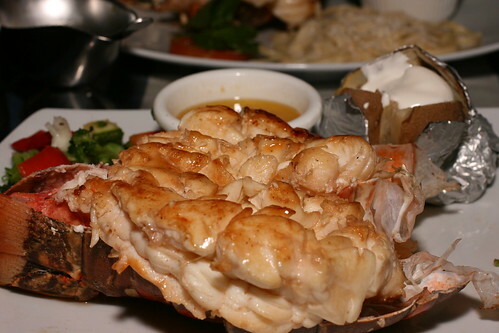 Blue Lobster is highly rated across most of the sites I found and has many solid reviews. For instance it’s rated the #2 place on this Top 10 list and Discovery Mexico wrote a glowing review. Not to mention the number of user reviews on various sites praising it. I wonder if they went to the same place as us? 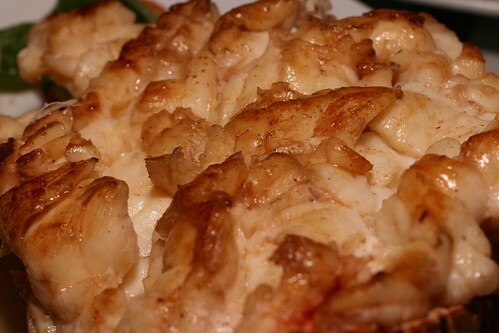 The reality is, that most probably don’t know good lobster from bad. 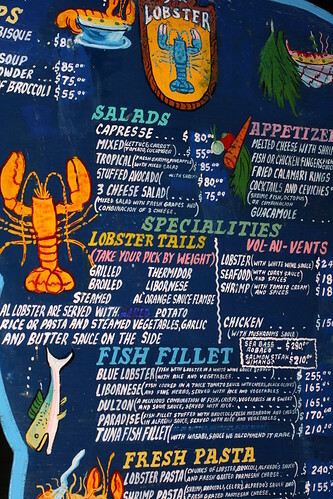 After having some of the best lobster in the world, we definitely have seen the full lobster spectrum. 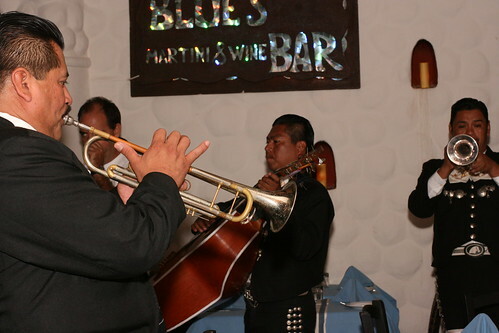 When we arrived at Blue Lobster, there was a decent crowd, filling the two levels of seating and a lively mariachi street band playing inside. The hostess was polite and seated us at our choice of a romantic, two-seater on the street level. They brought over the painted menu and topped it on a chair in front of us. It reminded me of my lunch at Superfine. 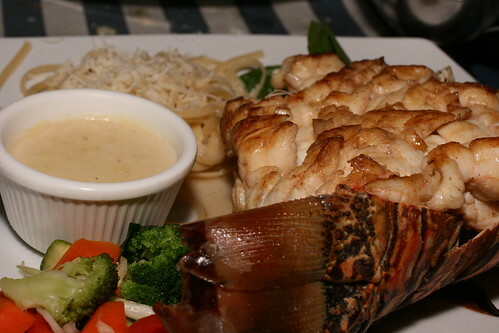 We asked a few questions and to see the lobster tails, which seemed to be the primary method of eating the lobster (other methods include in various pasta dishes, etc.). There were three sizes, big, bigger, and huge. Jessica opted for the smallest size, which was probably from a 2.5 pound lobster, and I opted for the largest, which was probably from a 4 pound lobster. 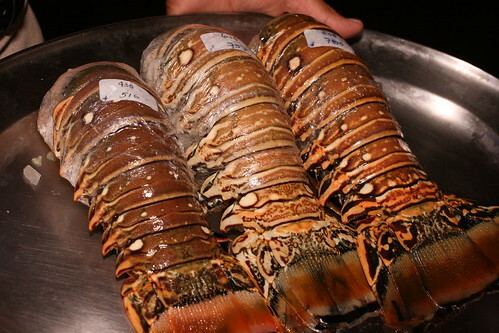 The prices were reasonable for such beautiful tails from spiny lobsters (where most of the meat is in the tail). We both followed the recommendation for broiling the tail. Jessica asked for the butter and garlic sauce and I selected the white wine cream sauce. We started our meal with some warm, but otherwise plain bread. 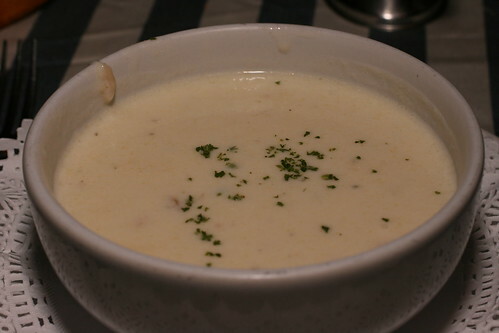 Then they delivered the Clam Chowder I ordered. Jessica and I agreed that the clams were plentiful and super tender. We enjoyed them, but felt like they were swimming in a butter sauce more than a soup. It was well flavored, but super rich. While awaiting our lobster, we warded of waves and waves of street merchants and musicians. Fortunately, it turned out the mariachi band playing when we arrived were street musicians who wandered off. They were good but incredibly loud. After they left we enjoyed our conversation at a normal volume. Our entrees arrived, and geez, they were big. And then we started eating. Uh oh. Ugh. The lobster was over-cooked. And that was only a part of the problem. The tails were not as fresh as they should’ve been. They were completely mediocre… at best. Neither of us finished the lobster meat, and in fact, I felt a bit nauseated from the low quality food. We both agreed it tasted like cruise food. Jessica did enjoy the side veggies (mixed broccoli, carrot, zucchini), because they were just lightly steamed, and her baked potato. I felt the veggies were boring and my side of Spaghetti Alfredo was super tiny and average. The price came to about US $115, which would’ve been just fine, if the food was good, but it wasn’t. When you’re in the neighborhood, make sure to absolutely skip this joint. It is a tourist trap and not good eating. posted by Lon	at 10:44 AM	Filed under Avoid Like the Plague, Restaurants, Travel. You can follow any responses to this entry through the RSS 2.0 feed. Both comments and pings are currently closed. $115 is highway robbery in Playa! I’d avoid most of the places on 5th Avenue… most of them are tourist traps. The problem is that your “research” consists of touristy websites not run by foodies. At this rate you might as well have picked up a Frommers book for your restaurant choices. If you’re depending on touristy websites, you can’t be surprised when you end up at a tourist trap. Anonymous, those sites are listed as a for instance (the first two that google popped up)…because we weren’t going to re-look up all the sites but it was referenced on several, plus we forgot to mention a local driver gave us the thumbs up on going when we read him a few places of our list. In any case, there really isn’t a whole lot out there on Playa. Our list also includes stuff from blogs, friends, and Rick Bayless’ site and it’s not that long.